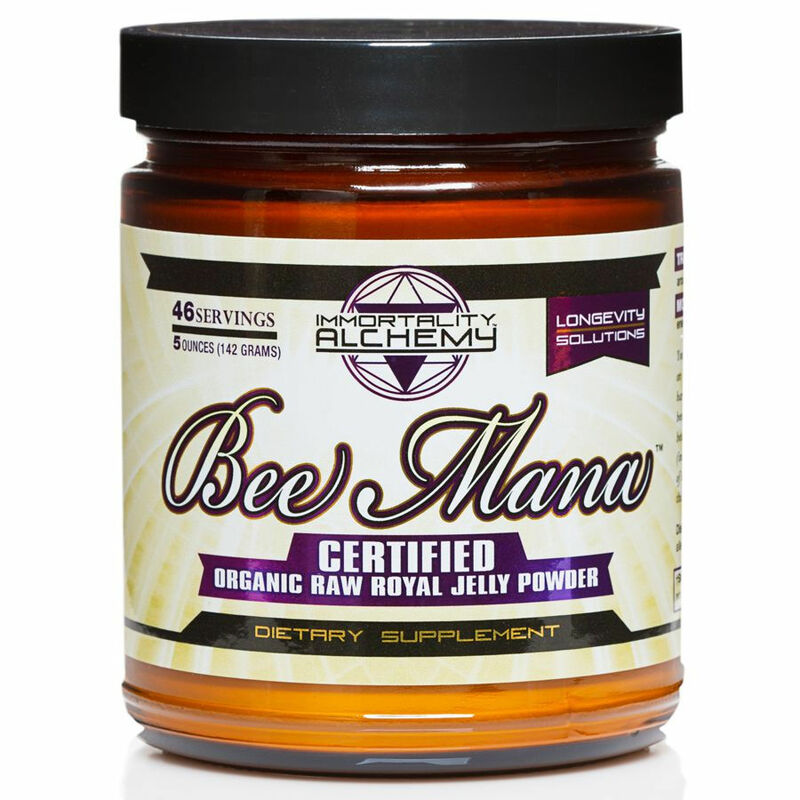 Immortality Alchemy's Organic Royal Jelly is the first and only Organic Royal Jelly on the market! Supplies are limited to ensure product quality. 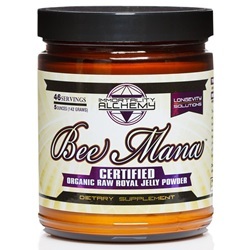 This Organic Royal Jelly is 3 times more concentrated than regular Royal Jelly. Organic Royal Jelly comes in a powder form. It contains remarkable amounts of proteins, lipids, glucides, vitamins, hormones, enzymes, mineral substances, and specific vital factors that act as biocatalysts in cell regeneration processes within the human body. Raw, Organic Royal jelly is rich in protein, vitamins B-1, B-2, B-6, C, E, niacin, pantothenic acid, biotin, inositol and folic acid. It is antibacterial and antimicrobial. Helps to clean up dysbiotic lifeforms in the blood and tissues. It is a highly hormonal food. It helps create the right amount of estrogen and DHEA (an anti aging hormone) to aid in balancing the endocrine system. Contains a plethora of B Vitamins, including human active B-12 (especially critical for vegetarians and those on a raw food diet), zinc, collagen, and plenty of amino acids and bioavailable protein. Assists with the mylienation of the nerves and with boosting brain function through several different pathways. Studies indicate the effectiveness of royal jelly for the following: for tiredness and overwork, asthenia, anxiety states, insomnia and anorexia, bronchial asthma, liver diseases (hepatitis), pancreatitis, diabetes, arthritis, gout, atherosclerosis, kidney diseases, stomach ulcers, keeping one youthful, vibrant, stimulating and regenerating the nervous system, for accelerating the healing and consolidation of bones and tissue. It also helps with depression, panic or anxiety attacks, Parkinson's Disease, Diabetes, Asthma, Arteriosclerosis, Malnutrition, Mental Exhaustion, Mononucleosis, Ulcers, Eczema, and Impetigo. Although royal jelly has been traditionally known to prolong youthfulness and improve the skin beauty, evidence indicates that this substance increases energy, alleviates anxiety, sleeplessness, moodiness, memory loss, and bolsters the immune system. Contains No Artificial Additives, Sweeteners, Colorings, or Flavors. Caution: Bee products may cause allergic reaction in some people. If pregnant, nursing or taking any medication, consult a health care professional prior to use. Additionally, it can be used in facial masks and creams for tightening skin.' Just a bit with some coconut oil or cacao butter, clay and a little witch hazel extract or powdered green tea (or if you are really going for it, hydrolyzed pearl extract).' Also a little MSM works wonders.' Mix this all up into a thin paste and apply to areas that need toning up and need to bring a little most "luster" out in the skin.' Royal jelly has long been used for skin conditions and to improve the quality of skin in China.' Again, a little goes a long way in this case since it is a concentrated powder.